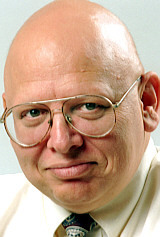 Bruce Keidan, former sports columnist and editor at the Post-Gazette and talk-show host at WTAE, has passed away at the age of 67. He had been battling diabetes and a heart condition, according to his son. He was just a little bit before my time in terms of the sports media saturation I now indulge in, but I know he had a tremendous following and an opinionated style. I'm sure some of you out there can elaborate in better terms on your memories of Keidan, because he was a multi-media star in this city when that wasn't the hip trend. While I'm coming up short on anecdotes from his working days, I can say that anyone who was this passionate about Pittsburgh sports is OK in my book. Sincere condolences go out to his entire family and may he rest in peace. I was a huge fan of Bruce's radio show, which he kept to a higher standard than most. I was especially fond of his Fall Friday's conversations with the Sports Book in Las Vegas, featuring Chuck Esposito. Amazing how he could talk about the different facets of gambling for an hour each Friday and always make it interesting. He was also one of the first in the media to openly speculate about steriods in baseball in the early 90's, when the rest of the media had their heads in the sand. He is and will be sorely missed. It's Superbowl Sunday and Bruce was on my mind for a few days now...I went online only to find that he passed away. What a great guy and a good man. He was classy and understood humility. Great sense of humor and was very compassionate. He was a good friend to me. RIP. My sincere condolences to his family.